For this weeks challenge I chose an off cut piece of paper that was just to good to toss. 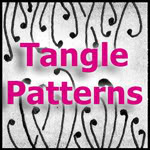 Fengle has been on my list of tangles to get back to so this challenge came at just the right time. Thanks Laura. Amazing, your tiles are always amazing. Wow! I absolutely love what you've done with Fengle! 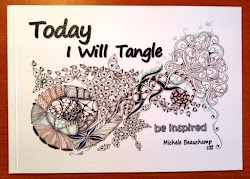 Your tangle is very graceful, love the swirls, composition and color. I love the feel of your Mooka-like Fengle, so soft and delicate! I also love how Quandary is falling off the paper. SOOO pretty! I love how you've morphed Fengle into this delicate creature. This is pure art!!!! Love your work Shelly! Absolutely gorgeous! I like your swirly Fengle. A wonderful harmonious composition! That's a great way of saying what I feel about Shelly's art. Thanks for finding the words for me! You both make me feel like dancing! I think you have a dancing pen. This is just beautiful and has a wonderful rhythm to it. Thank you I love dancing! I am at a loss to add anything. Your Fengle is so unique and flowing. Do not know how you come up with things like that. Like the cascading Quandry. Makes me happy just to look at it! There is rhythm, there is a flow in your tangles. Oh wow, what a very beautiful Fengle - so lacy and elegant! How beautifully done. Such nice gentle flow. This would be a beautiful bookmarker. I can not believe it. Its such a beautiful tile. Amazing.